Add an additional $30.00 heavy/bulky shipping charge per each. 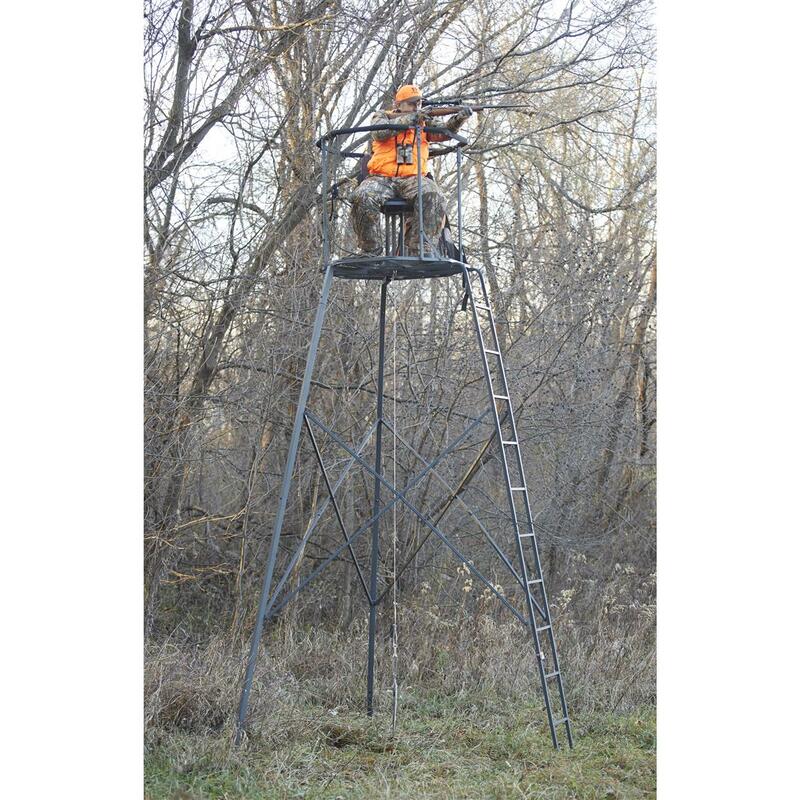 Give your hunt the boost it needs, even when there's not a tree in sight, with our Guide Gear® Woodsman 15' Rotating Tripod Deer Stand. 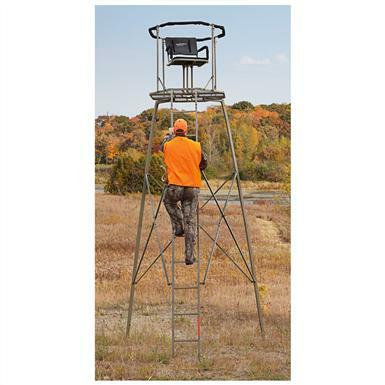 Climb atop for a long-range vantage point that's perfect for spotting your trophy. Sturdy, cross-braced steel construction provides reliable stability and safe climbing. 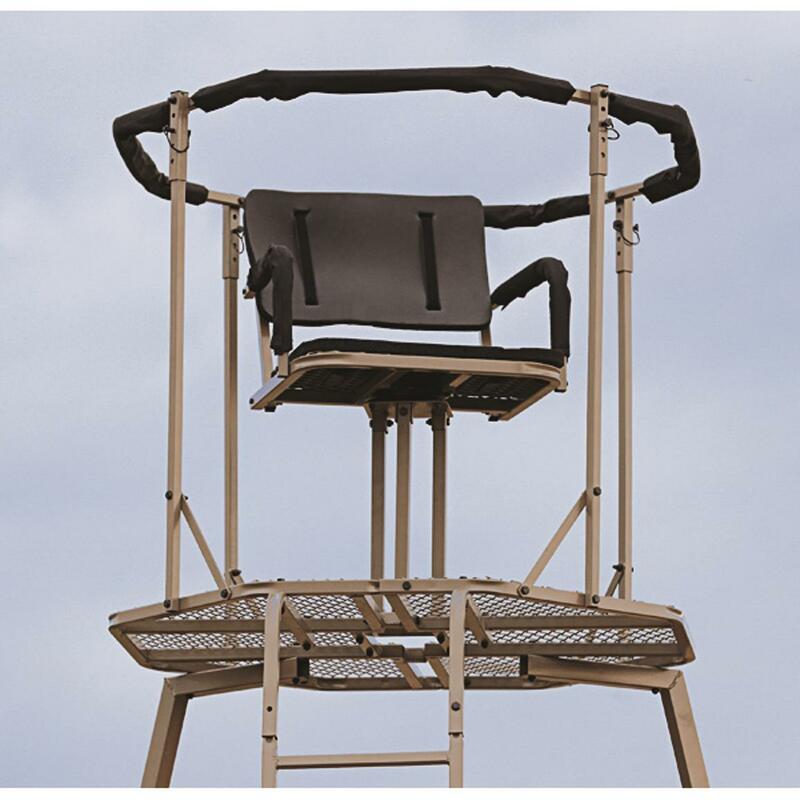 Roomy, 42" x 42" foot platform is stable and accommodating, and the see-it-all, swivel seat is cushioned for your comfort. 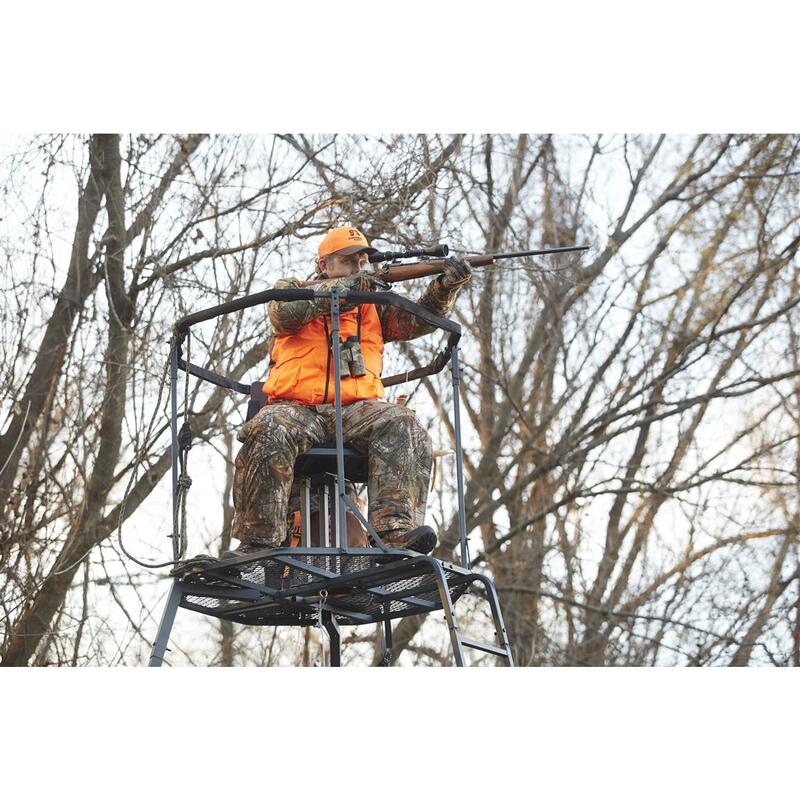 Add in the padded backrest and shooting rail and it just doesn't get any better than the Woodsman. Best of all, the seat rotates 360° for optimal placement on that once-in-a-lifetime shot. Great for open meadows, near the edge of a swamp, logged areas... you name it! 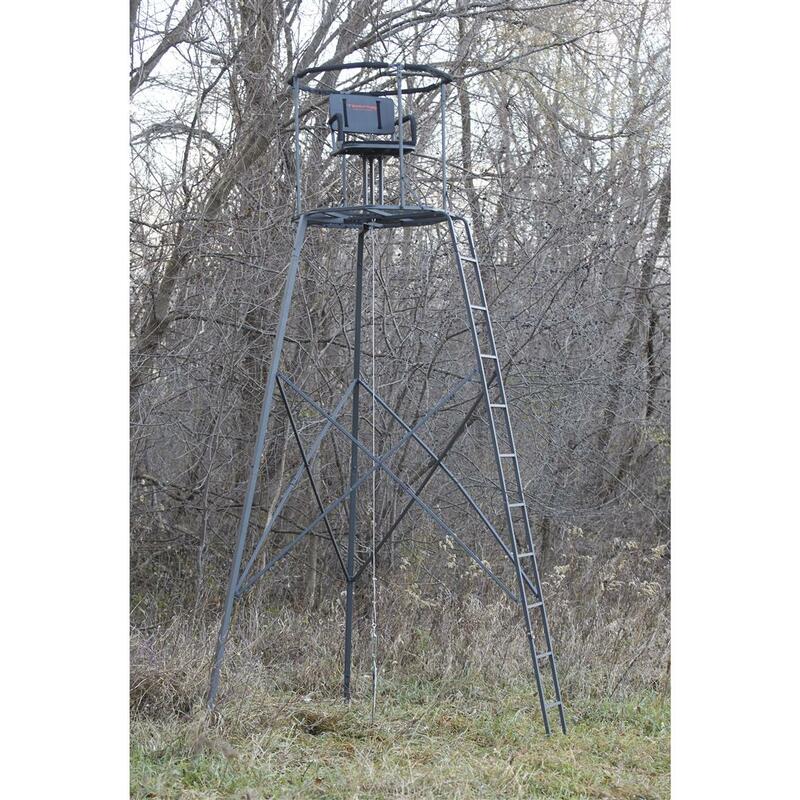 Platform Dimensions: 42" x 42"
Seat Dimensions: 20" x 14"
Guide Gear 15 Woodsman Rotating Tripod Deer Stand is rated 4.0 out of 5 by 79. Rated 4 out of 5 by Larry from This is a good product The Tri-pod stand is everything it was sold to be. It is strong, stable and very well made. The only thing I would caution is the assembly may take some buyers by surprise. Someone with lessor assembly skills than I will probably have a problem.It would help if braces were marked on each end with a corresponding mark where they attach to the leg or ladder. Rated 5 out of 5 by Capt Brian from Very comfortable and solid Very comfortable and solid. It was as stated in the SG book. It took a little time to figure out the first one, the other two went together with no problem. Each one had the precise number of bolts and nuts. I used a ratchet and a wrench on the first one , and a small impact and wrench on the next two I recommend the impact, its just faster. 13mm and 10mm socket and wrenches. 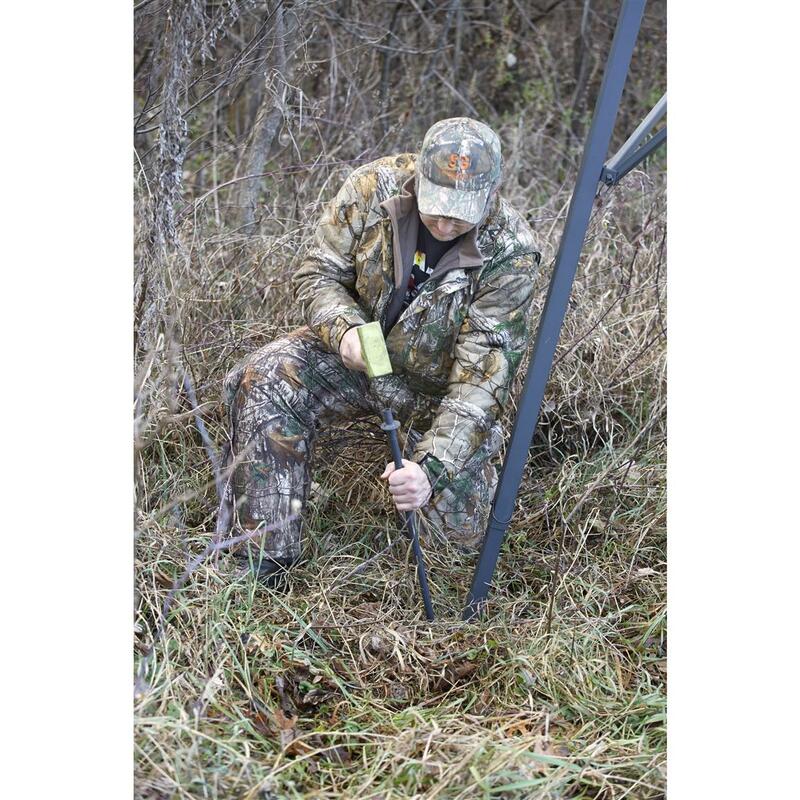 Rated 4 out of 5 by goodfella1775 from I think this is a good tripod and think it is well built. I did have some concerns with mine. When I took the parts out of the box, I noticed that there were parts that the powder coating was missing and still chipping off. I had some spray paint and covered the spots so that it would not rust as quickly. I have had the stand up for a couple weeks now in the elements and there is rust on the bolts and lock nuts but I think that is normal. The only thing I would change is the seat, it is pretty uncomfortable but that is a personal opinion. Overall it seems like a good stand I look forward to using it more over the season. Rated 3 out of 5 by PatM from Good product - instructions need work The product is stable, durable, and well designed. The instructions are sub par - they use poor quality photos to illustrate / highlight parts, leading to confusion. Assembly is straight forward - however pay attention to how the cross bracing is assembled and which braces are used where - there are two of one length, and one of another. Rated 4 out of 5 by PHILIP from NOT TOO GOOD Instructions, poor quality and not very leadable...missing parts...floor grid did not match upPlease send 2 bars and 2 brackets...photos attached.It is very sturdy compared to other Tripods I have and the force needed to get the floor grid together. 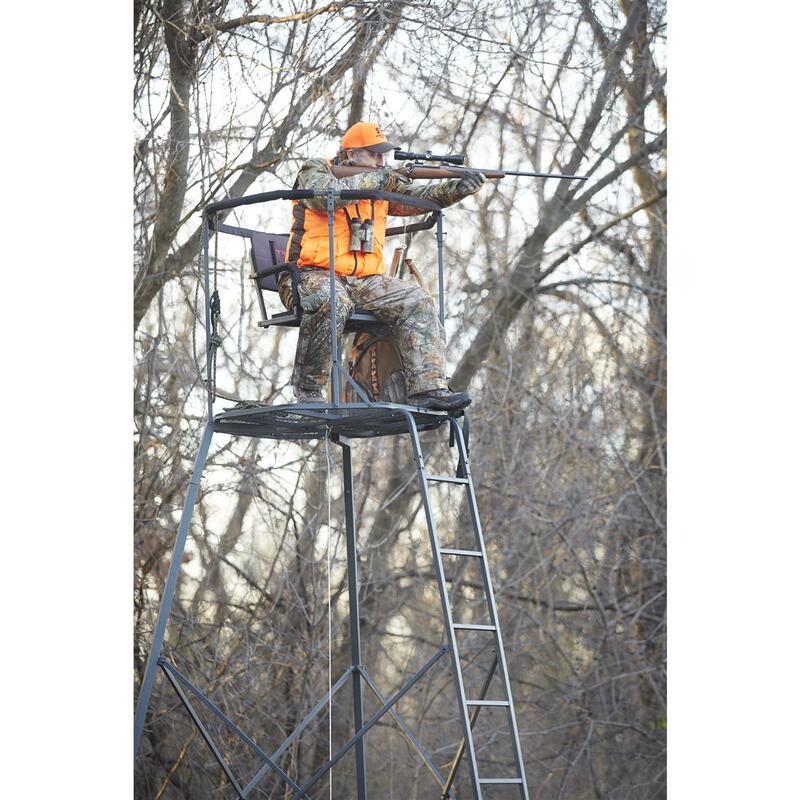 Comfortably hunt from 18' up. Extreme comfort, rock-solid, and easy to hang! Ultra-lightweight, roomy and deadly quiet.